I LOVE visiting my parents in Maryland in summer and digging in to fresh, delicious crabs. You get to be messy, consume warm butter, and swing a little mallet. There’s nothing better in summer! Since we’re in landlocked Colorado, I wanted to get a little taste of my summer-y treat that didn’t actually contain any crab (yes, I know you could just snack on Utz crab chips which are DIVINE… but we can’t get them here!!). 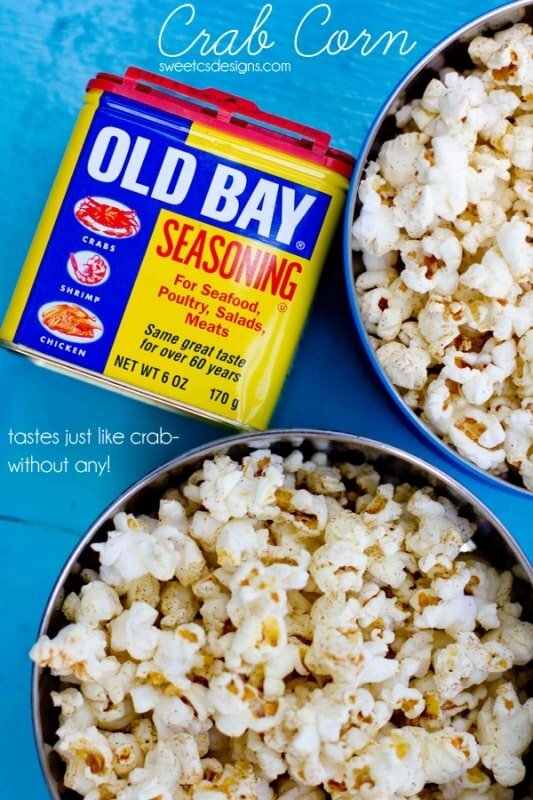 I was making some fresh popcorn on the stove, trying to grab the garlic powder (our usual popcorn seasoning) when I saw my oft-neglected tin of Old Bay. 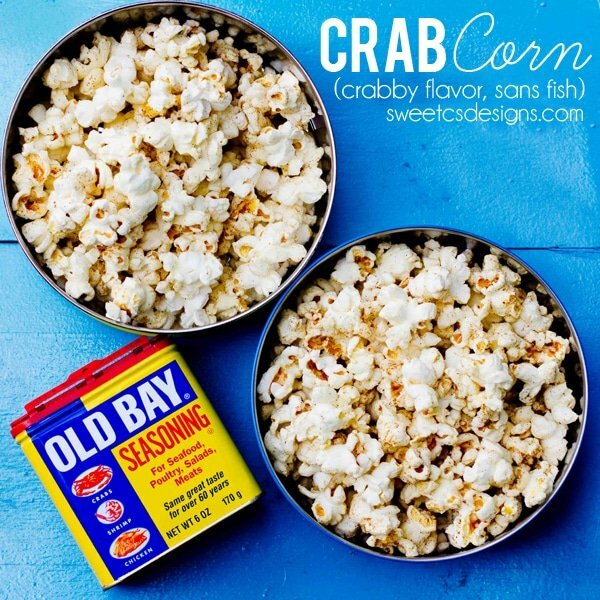 Inspiration struck, and I have for you a delicious Crab-boil inspired popcorn you wont be able to stop snacking- with no shellfish allergy concerns in sight. Want to make your own? Read on, friends! Set a large, tall pot on the stove and the heat to high. When warm, add olive oil and butter, stirring so the butter doesn't burn. When the oil/butter is shiny, add popcorn kernels and stir. When first kernel pops, add a lid to the pot. Grab pot handles (use a potholder so hot steam won't burn you), and slowly shake over stove, keeping it as close to the stove as possible. Once kernels stop popping for about 10 seconds in between pops, remove from stove and immediately transfer to a bowl. 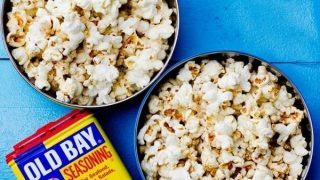 Sprinkle Old Bay, sugar and garlic powder over popcorn, while stirring batch, to evenly distribute. It HAS to happen right as the corn is hot because it will hold more moisture and allow the seasoning to stick without adding extra butter. If you'd like additional butter, drizzle 2 tbsp melted butter with a little Old Bay sprinkled in over popped corn. Crab corn tastes just like a crab boil- or Utz' crab chips- without the fish. 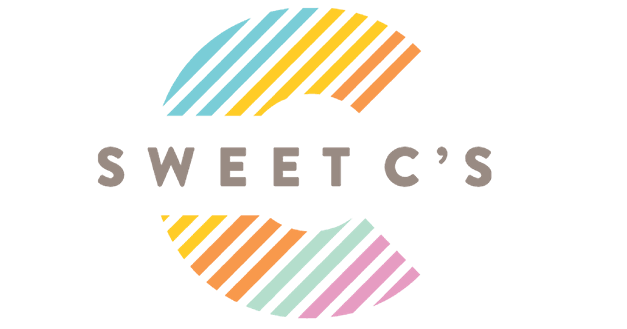 It's easy to make this addictive summer treat! This looks great! My husband and I just moved to Maryland a couple of months ago and have been loving all the delicious seafood here! And I love your take on the popcorn here! Sounds awesome!!! !